These Eerie Abandoned Locations Show Us A Time That’s Long Forgotten. There are many places all over the world that look as if they come straight from the pages of a fairy tale or from the scene of a horror movie. Places that have been abandoned by the people that loved them and were eventually overrun by nature. Keep on scrolling to check out some of those hidden gems of beauty. This abandoned asylum in Italy looks as if it was caressed by Bob Ross. Just look at all of those happy little trees. 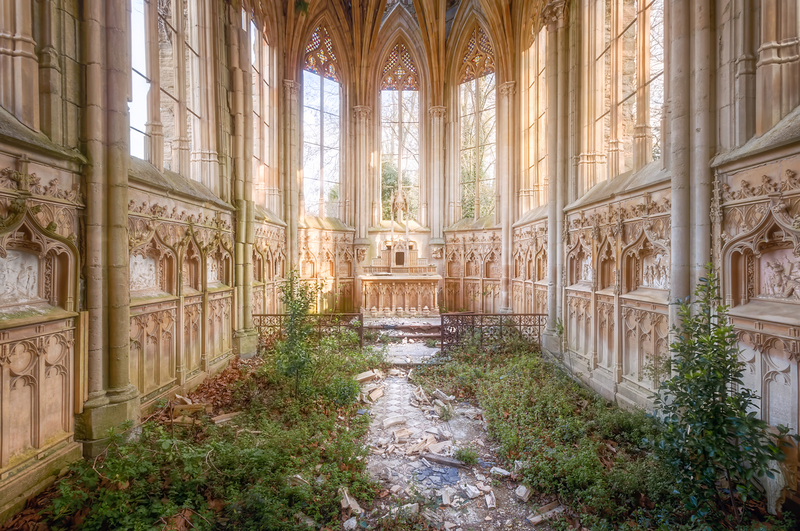 An abandoned chapel in France looks as if it was once the home to great kings and queens. With just a little imagination you can picture guests laughing while dancing the night away at a ball. We wonder what made all the scientists leave this laboratory. Maybe they found out how to turn metal into gold and now their extremely rich, enjoying life on the beach. A deserted rail car in Cape Charles looks like someone stripped everything out of it. Except for the chairs because no one needed those. What was once a cinema in the Egyptian desert, is now just a bunch of empty chairs. Why would they put a movie theater in the desert anyways?